How important was Atanarjuat's success to you? I always felt that the most important measurement of success for Atanarjuat was what it meant for Inuit audiences. Inuit audiences, I've always looked at as a series of circles. The centre circle are the people who work on the film and their families, elders, children. A lot of children worked on that film, now those children are teenagers and teenagers who worked on the film are young adults. The second circle is Igloolik as a community, whether the film inspired people here, if it made them feel good about their history, language, culture. Also it's about being able to get something done. In a place like Igloolik, the forces operating on people's lives from outside are so heavy that sometimes it feels like no matter what good idea you might have: hockey team for kids, bake sale or anything, the amount of work that it takes just to get something done is so enormous that a lot of people quit trying. One of the things that Atanarjuat demonstrated here, locally to the people working on the film, to the community, all of whom had a front seat; really saw how we did it they could see that this group of people, who weren't different from anybody else, actually got something very big done, were able to sustain that kind of effort and come out with a result. It inspired people, I think, not just that the film itself was good, but that getting anything done is good because it proves that it's possible. So maybe if these guys can make a film, maybe these other guys can fix the education system. Or if these guys can make a film, maybe these guys can get a youth centre going, or basketball league. The third circle is Inuit in general, Inuit in Nunavut and I think, to us, we're very conscious of Inuit being our primary audience. The first audience we want it to be alive for is the audience of Inuit, so that people are encouraged, feel confident that their language is a living language. Atanarjuat's success from my point of view- it's really all about Inuit. It's about the young people who worked on the film who grew up learning things that they never would have learned before, hearing songs they never would have heard before, learning how to sit on a dog team if maybe they've never had that chance before, but they did it because they were in the movie. The community; seeing that the community has the ability to do something large, that's not being organized by government or sold to people here by an outside mining company, or something, so that people can do something large that reflects their needs and their interests. To Inuit as a wider audience; that we're representing the importance and the possible success of the effort to preserve a living culture and language. The rest of the world is cherry on the cupcake. I know it's hard for people to believe us when we say that, or to believe me, but we're making this film for Inuit. My satisfaction is highest when I hear that there are kids in town who've seen our film 20,30, 40 times. You can go into any house of the community, tonight, and somebody will be watching it because they all have it on videos and dvd's. " Is it difficult to get funding? How do you get funding? We're in a kind of guerrilla war with the world's communication forces to enable a small cultural community to get access to what are really very tightly controlled technologies. Television and satellites are controlled by governments, militaries, and huge corporations. Film financing is a very exclusive club to try to break into. So, Zacharias and I and Paul Apak and Qulitalik set out 20 years ago to break into a system that we felt shouldn't be closed to people like us, shouldn't be closed to cultures and languages that weren't representing powerful forces, but the meaning of life on earth at the moment with thousands of cultures and languages. It took about 15 years to get Atanarjuat financed, and more work than I can describe or other people could even believe. What's the hardest part about making a film? Well, what I would've said up until last year would've been the political war to get a chance to do it. It's very tiring, very wearing. People wouldn't believe it. This time, the biggest challenge is that for the first time since Isuma first started making any kind of films (about 20 years ago) for the first time we have a larger cultural mix. We have mostly locals from Igloolik, but we will have Danish actors, we will have four people from Greenland, we will have others coming in from Copenhagen, Denmark, and a French actor from Montreal. A lot of our crew is coming from Montreal. So we have four or five different cultures working on this film together. While local Inuit make up the largest portion, it's a way larger number of people from outside this community that we've ever had before. To me, the difficult things are the things we don't know yet. Every time you do something once, no matter how hard it is, the next time you do it you know how it works. It's always the thing you've never done before, and this time I think it's having a mixed crew and making sure you can work together." What is the next film and what different roles do you play? "The working title of this new feature film is The Journals of Knud Rasmussen, that may or may not be the title that makes it to the big screen, but it's the one we've been working under. My roles are many, along with Zack, I'm a producer, we're co-directors and co-writers. We'll probably do a lot of the editing, even though we have an outside editor, but that person will work under our direction. I'm also the director of photography so I'll be looking after how the film is shot, and do most of the shooting myself. I also have a small part as Captain Comer. How much collaboration was needed? "Well filmmaking by definition is a team activity. It's not like writing poetry or music, it's something that is all about teamwork. It's why Inuit are good at it. There's a natural talent built into their values that can be adapted to a certain style of filmmaking. Their leadership lies in their teamwork. Everything is collaborative. The nature of our filmmaking is extremely unusual because we are integrating some the world's most modern technologies and modern artistic techniques with one of the world's oldest known storytelling cultures. Coming up with a unique mix of these two artistic sensibilities; one going back four thousand years, at least, here in Igloolik because that's how much archaeological evidence shows continuous habitation here. So for four thousand years in this place people have been carrying their culture through storytelling and songs, and not through writing. At the same time, Zack and I come in as video artists, we were professionals through the newest technologies. So mixing the new with the old is creating a completely new voice. The collaboration is between the Inuit culture and the experimental media culture. It's all about mixing across different boundaries. How do make the transition between the South and the North?
" I first came to Igloolik in 1985, so I'm sort of a lifer. I've been working and living in this community on and off, depending on the year, for two decades. With that said, every time I come in or go out, the transition from Igloolik to what we call the South which is the rest of the world, I find challenging the three day before traveling and the three days after. I don't find it's a transition between White and Inuit, I feel more like a transition in me between the pace of the life here, the me that lives in this environment and the me that is there. The feeling that these two identities are too far apart, when you're in one the other seems like a dream. To me, right now, Montreal seems like a dream. So you have to develop a taste, or rather, just get used to it, that part is always challenging to me. I'm an experienced traveler, but I've never gone anywhere that feels farther than between Igloolik and everywhere else." " Well I get up around 6:30 am and make myself a pot of coffee. I try to give myself a quiet hour in the morning, I usually read. I like that time of day when nobody's moving, long before the kids are going to school and my phone's not likely to ring. Then I start working by 7:30 or 8 in the morning and I try to work at home in the mornings because the office, as you guys know, is very distracting, very active environment. There are so many things that I'm responsible for that require a lot of focus, so I try to do a lot of my computer work, and e-mail, and important decisions that involve writing, I'll do at home. I try to come in here after lunch, sometimes during lunch, and I spent the afternoon talking to people. And I stay late, until about 7:30 or so. When I'm here, there's a lot of things people want to talk to me about, so I could if I were, I'd be available to talk all day, but that's very tiring. So I try to split my day, half alone and half in the public." I am Samueli Ammaq. I live in Igloolik. Although I was born in Sangunaniq, I just say I’m from Igloolik. I am only recently of Igloolik, but I live here. What do you do in Iglulik? Are you a hunter? Who are you and what is your role in the film? My name is Tooguyuk, which means “big fluffy dog”. I'm actually from Igloolik, and am Samueli Ammaq's lead dog. In the film, I am going to play the lead dog of the Greenlandic character Bosun (played by Qillaq Petersen from Qaanaaq). How have you been preparing for the role? I've been a chef for about 22 years. I started in my hometown of Sherbrooke, QC and I went to Iqaluit after that for about 10 years. I learned how to cook country food (caribou, seal, etc.) at Expo '86 in Vancouver in the Northwest Territories Pavillion. I learned how to cook country food over there. How long have you been with Isuma? Since December, 2004. Only a few months. 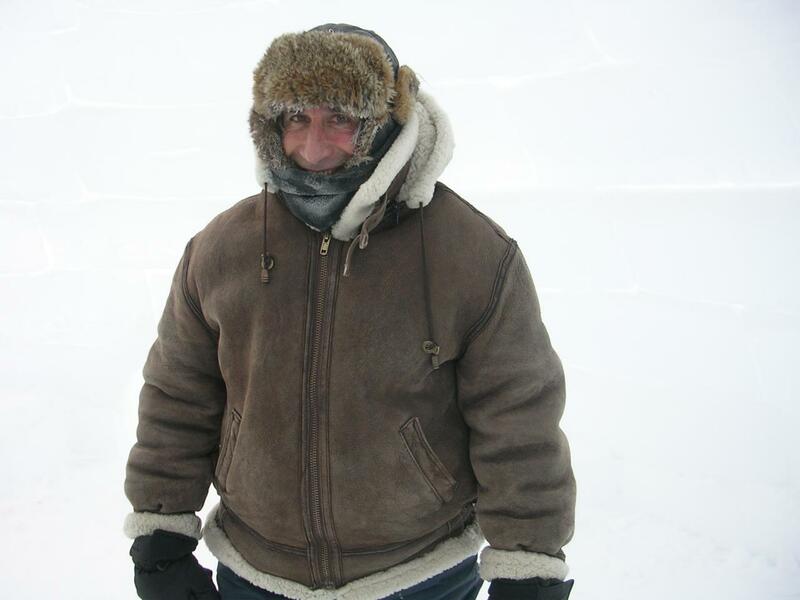 How important is the community of Igloolik to the film? It's important because all of the staff is from the community. Everything I need goes through the community. Most of the staff and qamutiks (sleds) come from the community. How do you like Igloolik so far? I've been here many times before. Since 1998, maybe, I've come up here once a year to work and to visit friends. I have some great friends here. I wear many hats. First of all I'm a sound man. I'm also doing the lighting for the interior of the sets. How long have you worked at Isuma? On and off for the past eight years. What drew you to work at Isuma? I'm working with JKR (The Journals of Knud Rasmussen). I‘m a script supervisor and a production assistant. How do you juggle both roles? My name is Michelline Ammaq. I’m the costume designer. I decide how the costume is going to be designed for the Igloolik cast. Are there differences between men and women’s costumes? I am Louis Uttak. I used to be known as Alianaikuluk. I bear my father's name. I was born in 1937. I am the Art Director, procuror of artifacts. Things I used to see in the past. Things like food, clothes, qulliit, igloos, many things. You've seen all those things? My education is in theatre design. I worked for years in animations and expressions, but I thought it was really boring because it always looks the same; like steel and wood and dust. So I contacted the Danish film school and got into there. Ever since then I've worked in film. What do you think of Igloolik so far? It's very white, very nice. I like it, it's very different. There's a lot of snow. I used to play in the snow when I was a kid, but never this much. It's like going back in time. What differences are there between Qaanaaq and Igloolik? It's okay. I am satisfied to be here in Igloolik. How is Igloolik different from your hometown, Siorapaluk (north of Qaanaaq)?